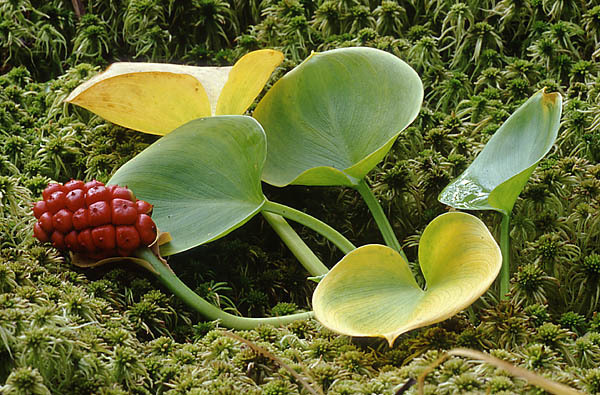 The bog arum is a plant of bog forests and overgrowing waters, and not very numerous. The plant has leathery, heart-shaped, beautiful leaves that begin to turn yellow now. The berries have turned a beautiful bright red colour, enticing bird to enjoy them. The plant and fruits are toxic to both men and animals. Birds eat the berries, the flesh of the fruit is digested and the seeds, with a dose of fertilizer, are spilled to the ground: so the seeds spread. Gardeners use the bog arum with success as an ornament in ponds and pools. The plant prefers to grow in water to its knees.